What a strange pairing this is. 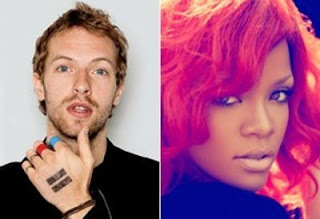 Indie bores Coldplay have roped in edgy singer Rihanna to duet with them on a new song from their upcoming album Mylo Xyloto called Princess Of China. Though the lead singer, Chris Martin, claimed Rihanna was chosen because of a love of her voice, I'm thinking this is more of a madonna style increase your relevancy /fanbase/ street cred by association. Cynical,much? Whatever the case, the pairing works. Surprisingly, Coldplay didn't just bring Rihanna in for the chorus, but gave the Barbadian singer her own verse and what seems like more than half of the vocals on the track. In fact if it wasn't for Coldplay being the composers and writers of Princess Of China it would have made for sense to have labelled this as Rihanna Featuring Chris Martin. Princess of China continues to demonstrate Rihanna's vocal growth. As well as the use of her usual modal voice, Rihanna gives us a few lines in her head voice to mix up her delivery as well as some quite challeging vocals in the harmony towards the end, but it's never at the expense of the character of her voice. .
Princess Of China is surprisingly quite good. The Chinese influence the title points to is heard prominately in the background drunken, wavering synths, simultaneously invoking memories of David Bowies' China Girl and Kasabian, but it has to be said it's a little messy and busy sounding. I'm glad coldplay didn't attempt to tailor the song to Rihanna and instead pushed her into a style she's not known for singing, the result is something quite fascinating being created. Nevermind, I like Rihanna's addition to the song. I think the only reason I'm listening to it is because of Rihanna though I do actually like Coldplay.I know its cliché to say but despite them making good music I just find them really boring. Yeah, you are right, but as far as I can remember they weren't Coldplay featuring these artists, they were tracks that were produced by them- or Chris- and they were only credited in the small print. Oh and I like that term "swimmy", very apt.